Close-up view of a woman with solar lentigo. Long-term exposure to ultraviolet radiation and pollution as one ages may induce the common solar lentigo. Depending on the type of lentigo present, a solitary lesion or multiple lesions can occur anywhere on the body. 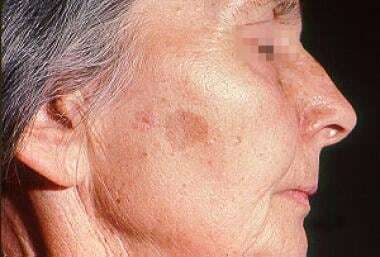 Some lentigines have associated systemic manifestations that accompany the skin lesions, such as the LEOPARD syndrome. A Japanese microarray analysis evaluation of solar lentigo in 16 adults demonstrated up-regulation of genes related to inflammation, fatty-acid metabolism, and melanocytes and down-regulation of cornified envelope-related genes. The researchers suggested solar lentigo may be induced by the mutagenic effect of repeated past UV light exposures, leading to characteristic enhancement of melanin production. Solar lentigo and ink-spot lentigo are associated with sun exposure in fair-skinned people. PUVA lentigines [10, 11, 12] are associated with PUVA therapy in patients with psoriasis. Genetic factors may be involved in other forms of lentigines, including XP, LEOPARD syndrome, Peutz-Jeghers syndrome, and inherited patterned lentiginosis. Lentigo simplex is the most common form of lentigo, but its frequency has yet to be determined. Alper and Holmes  noted multiple lentigines in 91 (18.5%) of 492 black newborns and 1 (0.04%) of 2682 white newborns; however, histologic confirmation of these lesions was lacking. Lentigines are observed worldwide. The incidence depends on the type of lesion. Ephelides, PUVA lentigines, tanning-bed lentigines, vulvar lentigines, ink-spot lentigines,  oral and labial melanotic macules, and Laugier-Hunziker syndrome are also more common in people with light skin than in those with dark skin. Ink-spot lentigo occurs in patients of Celtic ancestry. Acral lentigines are more common in dark-skinned individuals, but they may also be present in light-skinned individuals. PUVA lentigines are more common in men than in women. Tanning-bed lentigines and oral and labial melanotic macules are more common in women than in men. Lentigines can appear in both children and adults; however, children are more likely to have genetically associated lesions such as those of Peutz-Jeghers syndrome. Adults are more likely to acquire lesions due to chronic exposures, which cause solar lentigo for example. Lentigines are benign by nature. In patients in whom lentigines are associated with systemic abnormalities or complications, the prognosis may depend on the severity of the associated conditions. Treatments with cryosurgery, lasers, and/or topical creams have been successful (see Medical Care). Patients should be advised about the risks of sun exposure and the use of tanning beds. Derancourt C, Bourdon-Lanoy E, Grob JJ, Guillaume JC, Bernard P, Bastuji-Garin S. Multiple large solar lentigos on the upper back as clinical markers of past severe sunburn: a case-control study. Dermatology. 2007. 214(1):25-31. [Medline]. Byrom L, Barksdale S, Weedon D, Muir J. Unstable solar lentigo: A defined separate entity. Australas J Dermatol. 2016 Feb 2. [Medline]. Goorochurn R, Viennet C, Tissot M, Locatelli F, Granger C, Varin-Blank N, et al. Differential morphological and functional features of fibroblasts explanted from Solar Lentigo. Br J Dermatol. 2017 Feb 17. [Medline]. Aoki H, Moro O, Tagami H, Kishimoto J. Gene expression profiling analysis of solar lentigo in relation to immunohistochemical characteristics. Br J Dermatol. 2007 Jun. 156(6):1214-23. [Medline]. Hafner C, Stoehr R, van Oers JM, et al. FGFR3 and PIK3CA mutations are involved in the molecular pathogenesis of solar lentigo. Br J Dermatol. 2009 Mar. 160(3):546-51. [Medline]. Vierkötter A, Krämer U, Sugiri D, Morita A, Yamamoto A, Kaneko N, et al. Development of lentigines in German and Japanese women correlates with variants in the SLC45A2 gene. J Invest Dermatol. 2012 Mar. 132(3 Pt 1):733-6. [Medline]. Samuelov L, Sarig O, Gat A, Halachmi S, Shalev S, Sprecher E. Extensive lentigo simplex, linear epidermolytic naevus and epidermolytic naevus comedonicus caused by a somatic mutation in KRT10. Br J Dermatol. 2014 Dec 15. [Medline]. Hansen LK, Risby K, Bygum A, Gerdes AM. [LEOPARD syndrome]. Ugeskr Laeger. 2009 Jan 19. 171(4):247. [Medline]. Hickey JR, Robson A, Barker JN, Smith CH. Does topical tacrolimus induce lentigines in children with atopic dermatitis? A report of three cases. Br J Dermatol. 2005 Jan. 152(1):152-4. [Medline]. Basarab T, Millard TP, McGregor JM, Barker JN. Atypical pigmented lesions following extensive PUVA therapy. Clin Exp Dermatol. 2000 Mar. 25(2):135-7. [Medline]. Miller RA. Psoralens and UV-A-induced stellate hyperpigmented freckling. Arch Dermatol. 1982 Aug. 118(8):619-20. [Medline]. Rhodes AR, Harrist TJ, Momtaz-T K. The PUVA-induced pigmented macule: a lentiginous proliferation of large, sometimes cytologically atypical, melanocytes. J Am Acad Dermatol. 1983 Jul. 9(1):47-58. [Medline]. Peter RU, Gottlober P, Nadeshina N, Krahn G, Plewig G, Kind P. Radiation lentigo. A distinct cutaneous lesion after accidental radiation exposure. Arch Dermatol. 1997 Feb. 133(2):209-11. [Medline]. LaRosa CL, Foulke GT, Feigenbaum DF, Cordoro KM, Zaenglein AL. Lentigines in resolving psoriatic plaques: rarely reported sequelae in pediatric cases. Pediatr Dermatol. 2015 May. 32 (3):e114-7. [Medline]. Alper JC, Holmes LB. The incidence and significance of birthmarks in a cohort of 4,641 newborns. Pediatr Dermatol. 1983 Jul. 1(1):58-68. [Medline]. Kavak A, Parlak AH, Yesildal N, Aydogan I, Anul H. Preliminary study among truck drivers in Turkey: effects of ultraviolet light on some skin entities. J Dermatol. 2008 Mar. 35(3):146-50. [Medline]. O'Neill JF, James WD. Inherited patterned lentiginosis in blacks. Arch Dermatol. 1989 Sep. 125(9):1231-5. [Medline]. Bolognia JL. Reticulated black solar lentigo ('ink spot' lentigo). Arch Dermatol. 1992 Jul. 128(7):934-40. [Medline]. Campbell T, Felsten L, Moore J. Disappearance of lentigines in a patient receiving imatinib treatment for familial gastrointestinal stromal tumor syndrome. Arch Dermatol. 2009 Nov. 145(11):1313-6. [Medline]. Pollefliet C, Corstjens H, González S, Hellemans L, Declercq L, Yarosh D. Morphological characterization of solar lentigines by in vivo reflectance confocal microscopy: a longitudinal approach. Int J Cosmet Sci. 2013 Apr. 35(2):149-55. [Medline]. Roth DE, Hodge SJ, Callen JP. Possible ultraviolet A-induced lentigines: a side effect of chronic tanning salon usage. J Am Acad Dermatol. 1989 May. 20(5 Pt 2):950-4. [Medline]. Salisbury JR, Williams H, du Vivier AW. Tanning-bed lentigines: ultrastructural and histopathologic features. J Am Acad Dermatol. 1989 Oct. 21(4 Pt 1):689-93. [Medline]. Williams HC, Salisbury J, Brett J, du Vivier A. Sunbed lentigines. Br Med J (Clin Res Ed). 1988 Apr 16. 296(6629):1097. [Medline]. [Full Text]. Lin IS, Wang JN, Chao SC, Wu JM, Lin SJ. PTPN11 mutations in LEOPARD syndrome: report of four cases in Taiwan. J Formos Med Assoc. 2009 Oct. 108(10):803-7. [Medline]. Horvath A, Stratakis CA. Carney complex and lentiginosis. Pigment Cell Melanoma Res. 2009 Oct. 22(5):580-7. [Medline]. Vaidya DC, Schwartz RA, Janniger CK. 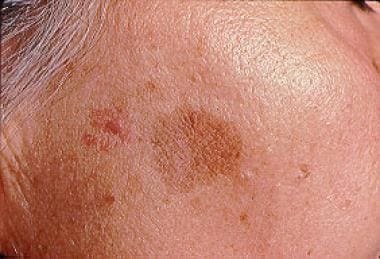 Nevus spilus. Cutis. 2007 Dec. 80(6):465-8. [Medline]. Tanaka M, Sawada M, Kobayashi K. Key points in dermoscopic differentiation between lentigo maligna and solar lentigo. J Dermatol. 2011 Jan. 38(1):53-8. [Medline]. Lallas A, Argenziano G, Moscarella E, Longo C, Simonetti V, Zalaudek I. Diagnosis and management of facial pigmented macules. Clin Dermatol. 2014 Jan-Feb. 32(1):94-100. [Medline]. Annessi G, Bono R, Abeni D. Correlation between digital epiluminescence microscopy parameters and histopathological changes in lentigo maligna and solar lentigo: A dermoscopic index for the diagnosis of lentigo maligna. J Am Acad Dermatol. 2017 Feb. 76 (2):234-243. [Medline]. Chan C, Magro CM, Pham AK, LeBlanc RE, Yan S, Barton DT, et al. Spontaneous Hair Repigmentation in an 80-Year-Old Man: A Case of Melanoma-Associated Hair Repigmentation and Review of the Literature. Am J Dermatopathol. 2019 Jan 29. [Medline]. Fraga GR, Amin SM. Large cell acanthoma: a variant of solar lentigo with cellular hypertrophy. J Cutan Pathol. 2014 Sep. 41(9):733-9. [Medline]. Zaballos P, Rodero J, Pastor L, Vives JM, Puig S, Malvehy J. Dermoscopy of lichenoid regressing solar lentigines. Arch Dermatol. 2008 Feb. 144(2):284. [Medline]. Shin J, Park JY, Kim SJ, Kang HY. Characteristics of keratinocytes in facial solar lentigo with flattened rete ridges: comparison with melasma. Clin Exp Dermatol. 2015 Feb 22. [Medline]. Unver N, Freyschmidt-Paul P, Horster S, et al. Alterations in the epidermal-dermal melanin axis and factor XIIIa melanophages in senile lentigo and ageing skin. Br J Dermatol. 2006 Jul. 155(1):119-28. [Medline]. Raziee M, Balighi K, Shabanzadeh-Dehkordi H, Robati RM. Efficacy and safety of cryotherapy vs. trichloroacetic acid in the treatment of solar lentigo. J Eur Acad Dermatol Venereol. 2008 Mar. 22(3):316-9. [Medline]. Hexsel D, Hexsel C, Porto MD, Siega C. Triple combination as adjuvant to cryotherapy in the treatment of solar lentigines: investigator-blinded, randomized clinical trial. J Eur Acad Dermatol Venereol. 2014 Mar 31. [Medline]. Pierard-Franchimont C, Henry F, Quatresooz P, Vroome V, Pierard GE. Analytic quantification of the bleaching effect of a 4-hydroxyanisole-tretinoin combination on actinic lentigines. J Drugs Dermatol. 2008 Sep. 7(9):873-8. [Medline]. Gillbro JM, Olsson MJ. The melanogenesis and mechanisms of skin-lightening agents - existing and new approaches. Int J Cosmet Sci. 2011 Jun. 33(3):210-21. [Medline]. Yamada T, Hasegawa S, Inoue Y, Kunita M, Ohsumi K, Sakaida T, et al. Inhibitory effect of Phalaenopsis orchid extract on WNT1-induced immature melanocyte precursor differentiation in a novel in vitro solar lentigo model. Biosci Biotechnol Biochem. 2016 Mar 4. 1-6. [Medline]. Ishikawa Y, Niwano T, Hirano S, Numano K, Takasima K, Imokawa G. Whitening effect of L-ascorbate-2-phosphate trisodium salt on solar lentigos. Arch Dermatol Res. 2019 Apr. 311 (3):183-191. [Medline]. Sezer E, Erbil H, Kurumlu Z, Tastan HB, Etikan I. A comparative study of focal medium-depth chemical peel versus cryosurgery for the treatment of solar lentigo. Eur J Dermatol. 2007 Jan-Feb. 17(1):26-9. [Medline]. Leroy D, Dompmartin A, Dubreuil A, Louvet S. Cryotherapy of PUVA lentigines. Br J Dermatol. 1996 Dec. 135(6):988-90. [Medline]. Ortonne JP, Pandya AG, Lui H, Hexsel D. Treatment of solar lentigines. J Am Acad Dermatol. 2006 May. 54(5 Suppl 2):S262-71. [Medline]. Bukvic Mokos Z, Lipozencic J, Pasic A, Fattorini I. Laser therapy for solar lentigines: review of the literature and case report. Acta Dermatovenerol Croat. 2006. 14(2):81-5. [Medline]. Todd MM, Rallis TM, Gerwels JW, Hata TR. A comparison of 3 lasers and liquid nitrogen in the treatment of solar lentigines: a randomized, controlled, comparative trial. Arch Dermatol. 2000 Jul. 136(7):841-6. [Medline]. Chan HH, Fung WK, Ying SY, Kono T. An in vivo trial comparing the use of different types of 532 nm Nd:YAG lasers in the treatment of facial lentigines in Oriental patients. Dermatol Surg. 2000 Aug. 26(8):743-9. [Medline]. Lee Y, Choi EH, Lee SW. Low-fluence Q-switched 1,064-nm neodymium-doped yttrium aluminum garnet laser for the treatment of facial partial unilateral lentiginosis in Koreans. Dermatol Surg. 2012 Jan. 38(1):31-7. [Medline]. Vachiramon V, Panmanee W, Techapichetvanich T, Chanprapaph K. Comparison of Q-switched Nd: YAG laser and fractional carbon dioxide laser for the treatment of solar lentigines in Asians. Lasers Surg Med. 2016 Apr. 48 (4):354-9. [Medline]. Nam JH, Kim HS, Lee GY, Kim WS. Beneficial Effect of Low Fluence 1,064 nm Q-Switched Neodymium:Yttrium-Aluminum-Garnet Laser in the Treatment of Senile Lentigo. Ann Dermatol. 2017 Aug. 29 (4):427-432. [Medline]. Campolmi P, Bonan P, Cannarozzo G, et al. Intense pulsed light in the treatment of non-aesthetic facial and neck vascular lesions: report of 85 cases. J Eur Acad Dermatol Venereol. 2011 Jan. 25(1):68-73. [Medline]. Josse G, Le Digabel J, Questel E. Protection against summer solar lentigo over-pigmentation with a SPF30 daily cream. Skin Res Technol. 2018 Feb 15. [Medline]. Thirteen-year-old Greek adolescent with xeroderma pigmentosum. Ephelides (ie, freckles) on the forearm of a 26-year-old redheaded patient. Fast Five Quiz: Are You Able to Identify and Treat Melanomas?